Popular Pockets...Free Patterns for you! WOW! MY Garment in Claire Shaeffer's NEW BOOK! I LOVE my Fed-Ex Man! Claire Shaeffer's newest Book ! 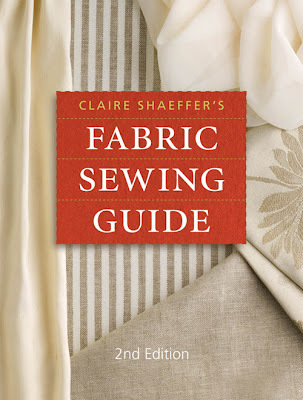 Since the first edition in 1989,Claire Shaeffer's Fabric Sewing Guide has been a one-stop resource for sewing and quilting enthusiasts, with answers to the most common fabric sewing questions and details about the latest advancements in sewing. This NEW, full-color, second edition has been completely revised and contains everything sewers need to know, and will surely reference again and again. In addition to an extensive glossary with answers to the most common sewing questions, this must-have guide includes easy-to-read charts for needle sizes and thread, interfacing types, the addition of 225 color photos and a fabric and fiber dictionary. 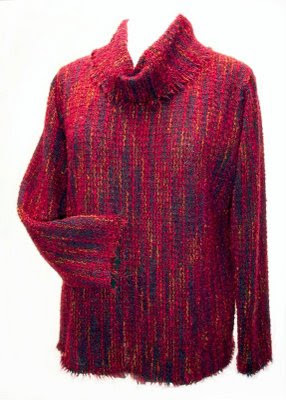 And of course I am beyond thrilled that my Acrylic Sweater Knit Tunic is featured...where else...but on the "Acrylic" page (page 97 to be exact) of the "Fiber Content" section! Thank-you SO much Claire...for writing such a wonderfully comprehensive book that will soon become a "MUST HAVE" in everyone's Sewing Library! And Thank-you for including me...which truly is an honor! Oh Pam, that is so wonderful. And it is so DESERVED!!!!! WOW!! That is SEW EXCITING!! Your interfacing is the BEST....EVER!! How fabulous!! Nobody deserves it more. Treat yourself to something nice, and celebrate! Congrats, Its a great accomplishment and well deserved. If you were in doubt before, no need to doubt now... You Have Arrived! Congratulations! Congratulations! That really is such an honor. She is such a professional, and must hold you in high regard. Cool Pam! Doesn't this make 2 Claire Shaeffer books that feature your clothes? Isn't one of your shirts in her "Sew Any Fabric" book too? Yes Andalee, about 4-5 years ago, Claire published "Sew Any Fabric"...and one of my mens shirts was pictured in that book. Pam I am so thrilled for you. You deserve this. You are so talented and an inspiration for me. Now I HAVE to buy the new book!!! You are so generous with all of your knowledge and experience. I couldn't think of anyone who deserves this more! That is so fabulous! I've got to get me that book. Congratulations!I'm adding your blog to my Favorites. Fantastic!!! I don't know how I missed this book....I love all her books! Congratulations to you Pam!! Congratulations!. I have added the book to my wish list and hope to get it in the very near future. Thanks for stopping by my blog. Glad you to have your comments. Fabulous !!! I don't know how I missed this book....I love all her books! Congratulations to you Pam! !